Panam is colloquial for Paris. And no one sings better than Leo Ferré when he romances Paris in his song ‘Panam’. He also sings the songs of French poet, Louis Aragon. Notably: ‘Elsa, Mon Amour Ma Jeunesse’ written for his beloved wife, Russian-born Elsa Triolet. This gets us to ‘la jeune fille’. We all noticed a slight accent when she spoke French. “Ah, bretonne,” would come the reply. No one knew much about Lettonie those days. The assumption was that she was from Brittany. Go figure. As for the name: Ilze. Ah, Elsa. Ah oui—Elsa, mon amour ma jeunesse! She didn’t tell anyone that back in… back in… uh… Flaketown…or… er… Scragsville or simply back in that place where there is no there (to cite Gertrude Stein) kids would tease young Ilze by calling her ‘Elsie the Borden Cow’. How weird. But that’s Flaketown for you. I prefer Paris. And so does she. Quite laughable to see ‘la jeune fille’ emerge from 8 rue Jacob in slippers and bathrobe.But, at the same time, it’s quite naturel. It’s an early morning ritual. A croissant run. Everyone in the quartier does it. By now postal workers are already on their second eye-opener at the zinc and queues are getting long at the local boulangerie. “Oui, mademoiselle”, Madame Germaine sings back as she scoops the fresh golden crescents right from the pan. “Au revoir!” Ilze intones as she grasps the greasy brown bag of warm buttery croissants and head out the door. Mon Dieu! There’s quite a handful of mail this morning. Most of it for her roommate, Ginny Stikeman. But wait. There is something for her! It’s an invitation. Up three flights of stairs, like a ballerina. Naturellement, she’s only barely twenty-one. As she reaches the second floor she can already smell the coffee. That’s Ginny’s job. Then back in bed with letters and a tray. A huge warm bed, the only one in the tiny apartment. How sweet to share with a girlfriend. In Paris it was comme il faut. Soon the phone will ring. What luxury! It will ring on weekends but on weekdays les jeunes filles sally forth to work. Ilze is a dental assistant (quel désastre!) to a pied-noir (derogatory term for an Algerian). Ginny works for an insurance company just off the Champs Elysée. Today is Saturday. The phone has not rung yet and so they linger over mail. Ilze inspects an invitation from the Akademia Raymond Duncan. Well, not a hot social event but being Latvian and being into the arts she makes a note of the date. Raymond Duncan and Aija Bertrand. Oh là là! These people! Even in Paris they are a spectacle. Aija Bertrand. So little is known about her other than that she’s Latvian. Some think of her as something of a slum landlady, although her crumbling old house is hardly in a slum. 31 rue de Seine has a certain bohemian cachet as it’s on the Left Bank and right in the heart of the Latin Quarter with its crooked narrow streets, small hotels, quaint bookshops, art galleries, antique vendors, cafes and cubbyhole restaurants. Aija Bertrand did not seem odd or shabby to Ilze but a goddess draped in a wool mantle and wearing what appeared to be a Latvian national headdress. Then there’s her husband, Raymond Duncan, the brother of the celebrated dancer Isadora Duncan, all decked out in long white Roman toga and sandals he’s fashioned himself. “Ilze,” I want to whisper. “Imitation is the enemy of creativity. Be an innovator, not an imitator.” I almost feel pity seeing her literally sitting at the feet of ‘le patron’. “C’est comme ça,” Patron instructs with a flourish, while his students light up cigarettes and ponder his demo. Then back to the easels and the bowl of fruit. Still lifes, nudes and harlequins are rotating themes. 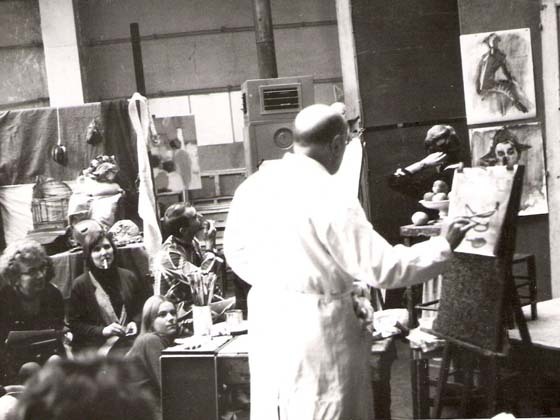 Every Saturday morning an eager group of would-be artists assemble at the Academie Julien on rue du Dragon. The atmosphere is terrific. The artwork less so. Non, I regret to say. Paris in the 60s is no longer the exciting artists’ Mecca it once was. (C’est New York). Ah, but she’s so proud of her Place Furstenberg digs. Let me tell you, it wasn’t always so. A series of ‘chambers de bonne’ reached by an outside winding staircase, no water, a bed pushed diagonally to accommodate her tall stature. Then the live-ins (au paires) with wealthy Parisians where she shared the children’s quarters and the miserable back rooms with aged landladies. But then lady luck in the guise of fellow McGillian, Ginny Stikeman, smiled on her and the two young ladies shared the apartment on loan from a member of the Canadian diplomatic corps who had gone to Africa. Ginny had a Citroen 2CV and life took on an even more dynamic turn. Non, non et trois fois non! I will not descend into that strange, sinister, underground. I will not venture down into a place paved with another woman’s past—a past which whispers secrets and hums loudly with her happiness. Zut alors! Where will it take me? What if I am not alone? What if a gentle hand were to take my own and lead me down those wide ancient steps and into the cool passageway where I can hear the echo of her heartbeat? A hand tightens over mine. Suddenly I’m no longer afraid. I step down those well-worn steps and leave my own world behind. A vast silence engulfs me as I journey backwards into the dark mysterious passage of time. Back, back… until a soft beam of light appears before me and leads me into brilliant daylight. I’m back to a million years before. Or so it seems to me. I take a few paces forward and there she is, struggling with two massive suitcases as she totters on flimsy shoes crossing the Pont de la Concorde. I have to laugh. No one does that in Paris. There are taxis everywhere. “Ilze!” I call. But then realize that she can’t hear me. She’s in her own world. And so am I. I can only watch. Clearly she’s just come from the boat train, having spent a night in a flea-infested so-called hotel across from the Gare Saint-Lazare. A bit of a let down, I bet, after ten glorious days on the SS Homeric crossing the Atlantic from Montreal to Le Havre. (Incidentally the last trans-Atlantic crossing for the ship). She’s barely twenty-one, tall, full of life, long blond hair, which caught the attention of the preppy males off to Europe on their Grand Tour. Shipboard romances were just passing fancies. What lay ahead was the city of her dreams. Paris. Strange that. Where did this passion come from? Of course there were the mesmerizing lectures of her French professors at McGill University while all others around her were dry and boring Anglo Canadians. She was no preppy. She waitressed and saved and booked a ticket on the SS Homeric. She would never forget that crisp autumn day, her heart beating excitedly, when she walked down Beaver Hall Hill to the Steamship Line office to pay for her ticket. It was September 1963. Her mother helped to pack her steamer trunks. You are currently browsing the archives for the “My Paris” category.